South Korea's LG Display has developed a solar panel for an e-book reader. The panel is 10 centimeters in width and length and has been combined with a Sony Reader electronic book to prove the concept, according to a photo issued by the South Korean company. A working prototype of the panel and e-book reader will be on show at the International Meeting on Information Display (IMID) than runs this week in Seoul. The cell is less than a millimeter thick and weighs just 20 grams so won't significantly increase the weight of an electronic book reader. E-book readers already offer a long battery life because their electronic paper displays draw power only when the page is being turned so the addition of a solar panel could mean regular readers never have to worry about charging the devices again. 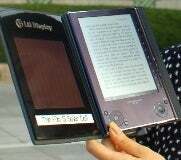 Exposure to sunlight for four or five hours would provide enough power to run the e-book reader for a day, said LG Display. The solar panel used in the prototype has an efficiency of 9.6 percent and LG is aiming to increase this to 12 percent next year and 14 percent by 2012 at which time it should be read for commercialization.